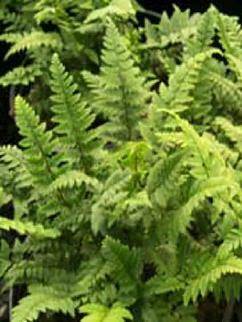 Broadly triangular fronds can be 12-24 inches long and 12 inches wide on this tropical, semi-evergreen fern. What prompts us to finally include it in our catalog is the shiny rich green frond with a mid-rib of pale gray-green (almost yellow). 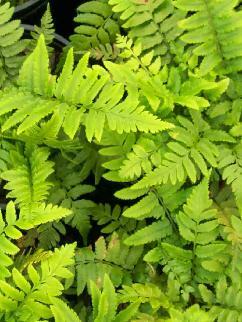 This striking fern has a place in our local shade gardens provided the moist, rich, well-drained soil it prefers. Be aware of its potential tenderness depending on its location in the landscape. 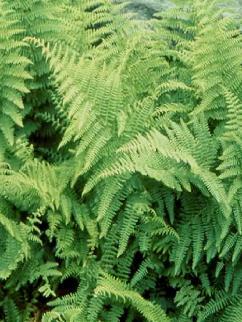 A lacy, upright habit characterizes this most common and variable native fern which reaches 18�24 inches. It is a lovely lime green with reddish stems, and is as delicate-looking as is possible. It can handle quite a bit of sun or shade in soil that is neither too dry or too wet. Deciduous like the specie above, Lady in Red is also as tough and easy to grow for woodlands or the shady perennial garden. Vibrant burgundy color runs through the stems, contrasting not only with the 30-36 inch lime green fronds, but with other shade lovers such as purple-leaved Heucheras, blue or variegated Carex, any number of Hostas, and Polygonatum Variegatum. Often considered the most decorative of ferns, this deciduous 18 inch Oriental beauty blends gray-green fronds with wine-red stems. It is slow-spreading and thrives in shade or partial shade where soil is moist but well-drained. Its tri-color fronds emerge early in the spring making it a perfect companion for early bulbs. Try it with Astilbe c. Pumila and Hosta s. Elegans for a long season of texture contrasts. A very hardy fern. Glossy, dark green leaves closely resemble Holly leaves and are so striking that we decided to include this evergreen fern which requires moderate wintertime temperatures to thrive. 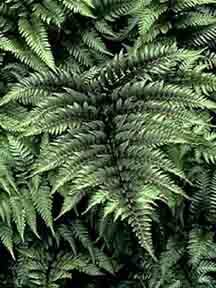 Fronds can be 24 � 30 inches in length. The leaf margins are coarsely fringed, grow thickly and quickly, and are definitely eye-catching. 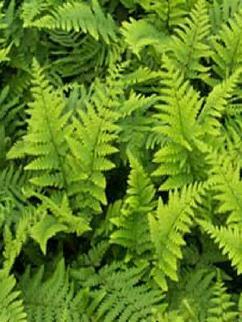 A rapidly growing lime green deciduous native fern with a lacy texture, it spreads from rhizomes and is useful as a ground cover for part sun or shade. It grows to 3 feet and its fronds smell like fresh-cut hay if crushed or bruised. A lovely rich green, compact grower, Shaggy Shield reaches only 24 inch in height and is semi-evergreen. 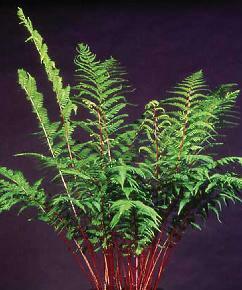 Like the Christmas Fern, its fronds are thought to resemble those of the Boston Fern. 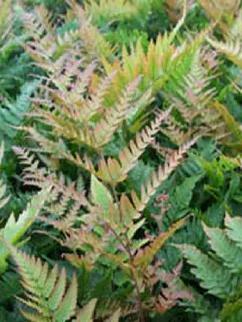 So named due to its copper color when young, our native evergreen Autumn Fern matures to a lovely dark green. The 24 inch upright fronds take on an autumn color again in the fall. They thrive in open or dappled shade. 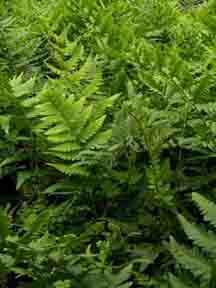 All ferns grow best in soils with a high organic matter content. 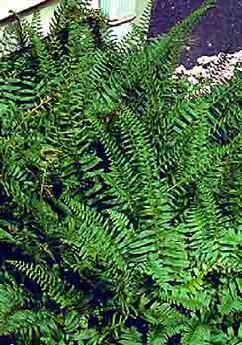 This cross between the Log Fern and the Southern Wood Fern is rich in color and is semi-evergreen with large, erect, tall fronds at 4-5 feet when fully grown. 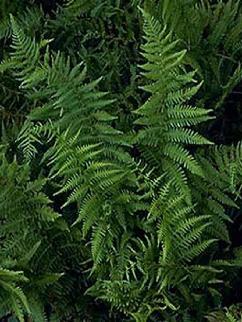 This is a particularly big, strong fern for the woodland garden, or for naturalizing, and is found throughout the southeastern U.S.
Also commonly called the Leatherwood Fern or Marginal Shield Fern, this native clump-grower has dark green, upright fronds between 2 and 3 feet in length, and handles shade or part shade. As hard as it�s been to keep large evergreen ferns in stock in our nursery, we decided to arm ourselves with more. Try this evergreen 4 foot beauty. It will remind you of the Christmas Fern, but bigger and stockier. It will thrive in rich, moist well-drained shady soil. Stately, upright 3 � 4 feet fronds resembling ostrich feathers grow by underground runners, die back in winter and reappear vigorously the next spring. The native Ostrich Fern tolerates wet soil conditions so give it room in moist, rich soil and it will provide erosion control as well as a dramatic effect. While it prefers open shade, it will tolerate sun in swampy areas. 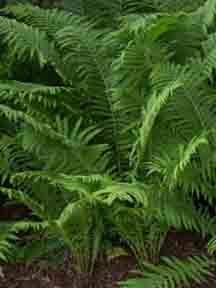 The native Cinnamon Fern, at 3 � 4 feet, makes an excellent backdrop in a woodland garden where it likes an acid soil with constant moisture, and can even handle wet, swampy land. Its name derives from the erect brown fronds that appear in the spring. Pale green initially, foliage darkens during the summer, turning a rich brown by autumn. It can handle some direct sun if the soil is kept moist. 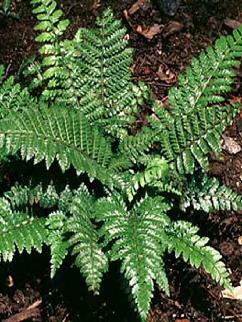 This slow-spreading native fern can be grown in wet soil in sun to partial shade. 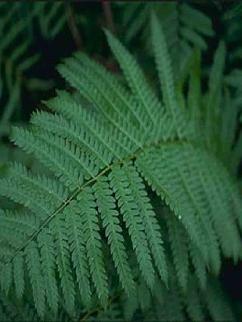 Its lance-shaped, dark green fronds grow tall and erect between 3 and 4 feet. 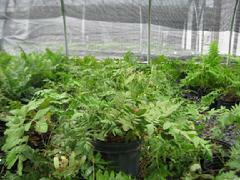 The Royal Fern will do well in wet areas. 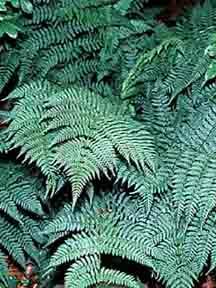 Similar in looks to the familiar Boston Fern, this dark green, evergreen, native fern can tolerate rocky soil common to our forests. It thrives in shade, but will tolerate some sun if it stays moist. Its 2 foot fronds are sometimes used in Christmas decorations. 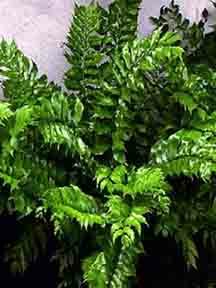 Striking beauty and reliable hardiness are the complementary qualities of this 18�24 inches evergreen fern. 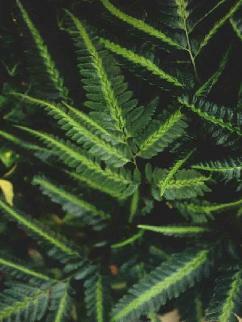 Its dark green, shiny fronds form a rounded rosette shape. Showy and easy to grow, it prefers full to partial shade. Considering that ferns have outlived the dinosaurs, it is not surprising that this adaptation is evident in this neat, compact evergreen fern. It is of modest size at 12 inches and appreciates protection from winter winds. Gorgeous with the blue-green leaves of Hosta s. Frances Williams. Stiffly erect, lime green fronds characterize this non-evergreen fern, with its elegantly drooping tips. 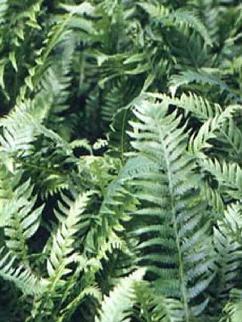 A tough fern of moderate height at 2 feet.